The Circus Project runs an extremely popular Youth Circus Programme for children aged 7+ throughout term time. Students have the opportunity to explore a range of aerial equipment including trapeze, rope and silks, as well as ground based activities. We are interested particularly in raising the standard of youth circus, nurturing talent and encouraging innovation and excellence. We believe anyone can learn circus – we don’t exclude anyone, and our classes are fun, friendly and non-competitive and we encourage everyone to help each other. Circus skills can be used as an educational tool to enhance lives and encourage positive social and personal skills. Evidence shows that students engaging in programmes that teach aerial and floor based circus skills identified improved behaviour, attitude, participation and ability to work as a team. In addition, the benefits of being physically active are extensive. 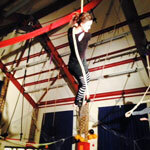 Learning circus skills is unique and great fun, making it more likely that people, young and old will participate, and will find it more memorable and enjoyable. Classes run in term-time only, with each half term block consisting of between 5-7 weeks. We follow Brighton & Hove’s school term dates closely. Do I have to book onto a class? Yes, all children participating in our Youth Programme need a pre-booked place, youth classes are not run on a drop-in basis. We will not be able to teach children who have not formally been offered a place by either our administrative or teaching staff. At the moment all of our classes are full, but we do run a waiting list so that we are able to offer places when they become available. At what age can my child join the Youth Programme? The Youth Programme classes are available to children/teenagers, 7 years to 16 years old. Our adult classes are subsequently available from ages 16 years and above. We are looking to start classes for younger children but are yet to confirm any dates. What should my child wear to a class? Children should wear stretchy, comfortable clothing that allows easy movement. A unitard, stretchy leggings with a leotard or a fitted t-shirt (one that won’t come up when you are upside down!) with sweatpants are appropriate. 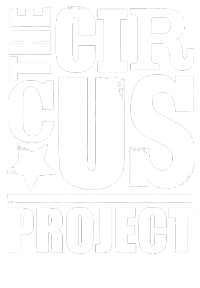 The Circus Project also sells youth t-shirts and hoodies with our logo (See Merchandise Page). All classes run at our base at Hangelton Community Centre, Harmsworth Crescent, Hove. There is a Centre car park, as well as lots of on-street parking. . The Brighton & Hove Youth Circus Company (B&HYC) is The Circus Project’s contemporary youth circus company. The company is for highly skilled young people (usually over the age of 14) who aspire to a career in circus and are passionate about training at an advanced level to develop to their full potential. 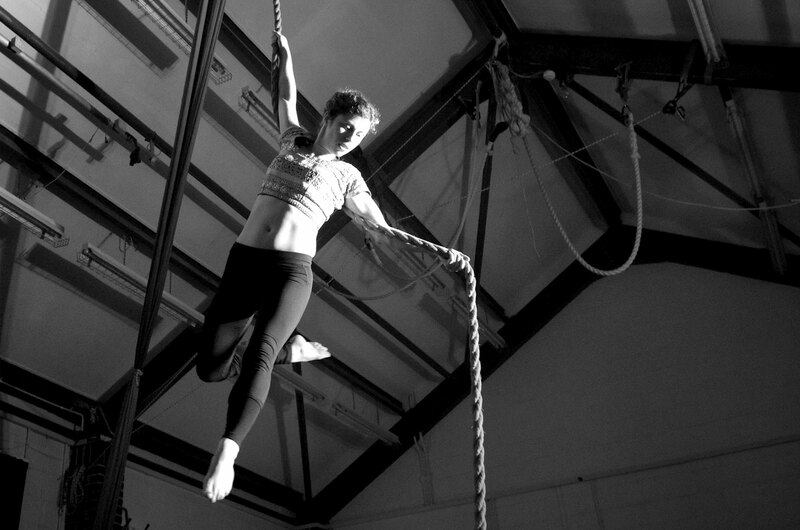 B&HYC provides high quality aerial circus theatre training and performance opportunities. Students join B&HYC by invitation only. Company members attend weekly technical classes and sometimes periods of intensive rehearsals to train and produce new performance work and they have opportunities to work alongside high profile contemporary circus companies and artists. The company experience devising theatre, creative writing, choreography and creating characters and stories using circus, theatre, dance and more recently, animation, film and multimedia. The company has performed at theatres, international circus festivals, local events, outdoors and indoors, and at all sorts of other venues and sites. The Circus Project has established links with the circus sector all over the UK and is actively involved in the development of UK youth circus. We are interested in raising the standard of youth circus, nurturing talent and encouraging innovation and excellence. Every half-term and holiday break we run taster workshops for children to try out a range of circus skills (including trapeze and silks), as well as floor based activities (tight-wire, hula hoop, acrobatics and juggling). For ages 6-14 years the workshops are a great opportunity to find out if your child would like to do further circus skills training, as well as a great opportunity for those already participating in the Youth Programme to train during holiday breaks.